Church this morning with Dear Sweetie, then out for a nice lunch with the Old Folks. Home now, and on the porch. It's 74 with a slight breeze, and it's lovely. The pup gnaws a bone, and I'm burning Old Standby in this International Select. Club soda on the side. Happy Sunday, all! Same pipe, this time loaded with Lane 1Q. I heart bagels too. I'm either a Pumpernickel or Salt type fella. If I wasn't so allergic to sesame that would be my goto.. they look good. PA in the Brylon Bulldog. My only complaint about these pipes is that the bowls are gigantic. It's about twice the normal volume of tobacco that I'd smoke. I consider this a positive quality. Another bowl 2:1 of Lane White Burley, and this time unstoved Lane Virginia in the Dr. G. The unstoved stuff is really coming through with the sweetness. 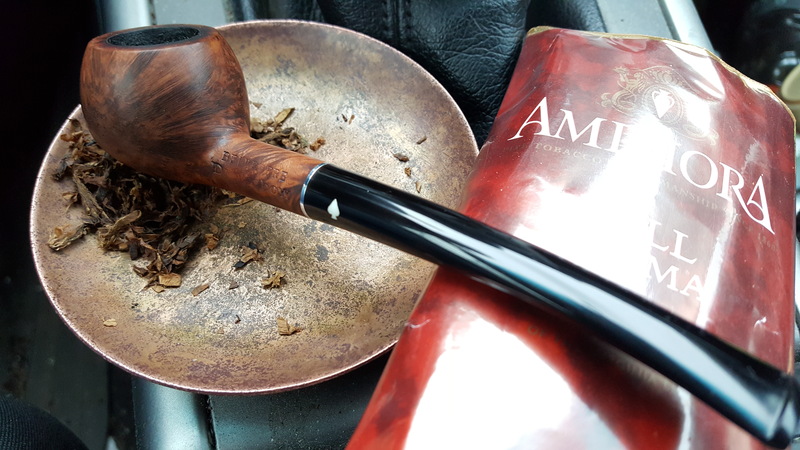 Unsurprisingly, since they are both Lane tobaccos, I am getting a ready rubbed sort of vibe off of it. I think that if I put just a tad bit of cocoa casing on the Burley, it'd be spot on. 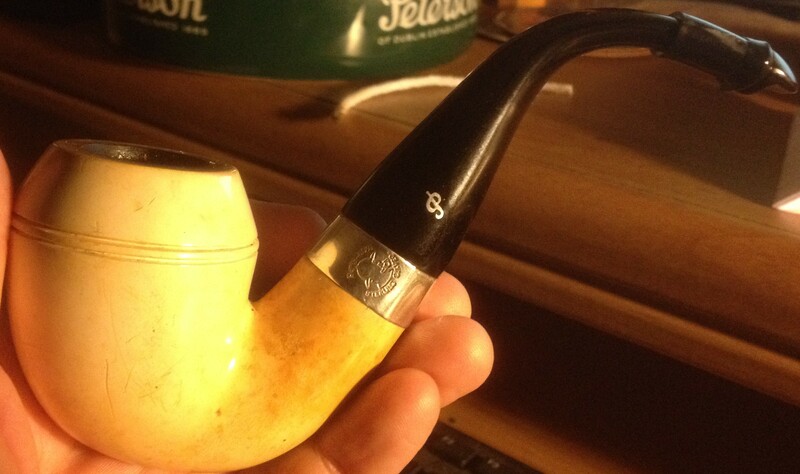 Having another bowl of this.. same Grabow. Hopefully pressing this will slow down the burn, because as it is now it burns fast and the nic hit can be a little surprising. St. Bruno RR / Three Sails Mix . . . Falcon w / Bantam Algiers . . . Mug of Stout Brewed Ceylon. 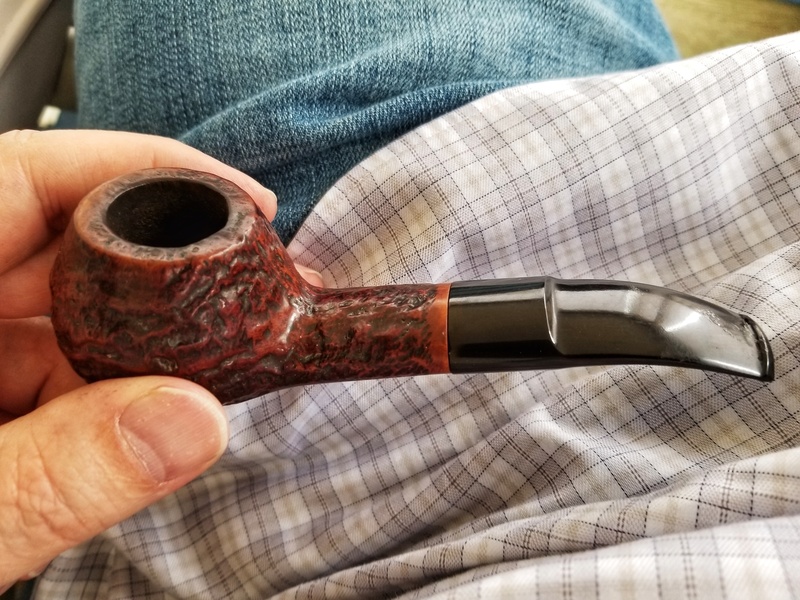 I had a few slices of pizza for dinner and am now settled into my office chair for a bowl of English in the Peterson Baskerville Meer.